Letters, I’ve got letters. I’ve got lots and lots of letters ready for Mr. Postman. He’ll take these letters away and point them in the directions of Maryland, Massachusetts, Washington, Virginia, South Carolina, New York and points beyond. You see, I’ve been catching up on my correspondence. Though I am known as A Lady of Letters, one who writes at least one or two letters each and every day, life does occasionally step in intruding on my delightful letter writing ritual. I do hate when this happens, but life is not perfect. There is however a saving grace to this intrusion. If I’ve been deprived of my daily letter writing routine I feel entitled to take the first free day that happens by in order to catch up on all my correspondence. Imagine the fun … an entire day of letter writing with no guilt, a day spent writing letter after letter until I’m back on track. 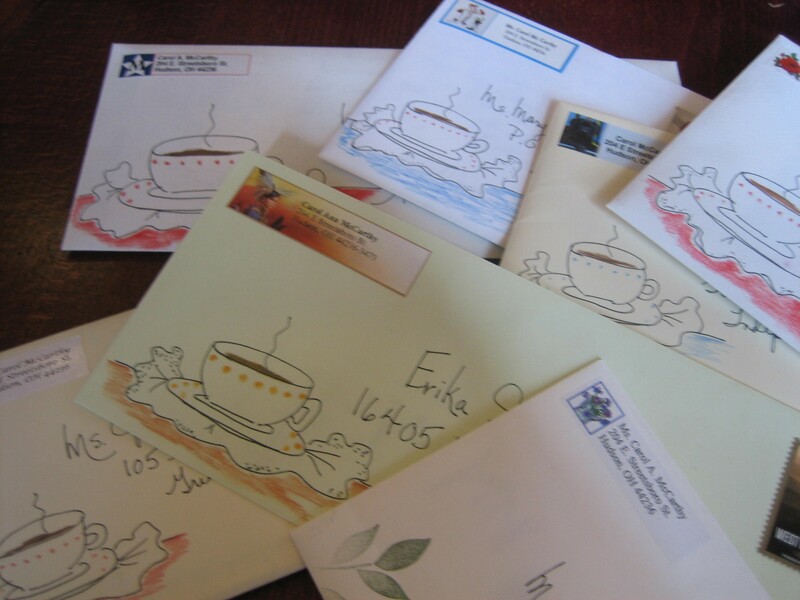 This week all the letters I’m sending off have cups drawn on the envelopes filled with coffee, tea, or whatever drink my letter friends prefer to imagine. 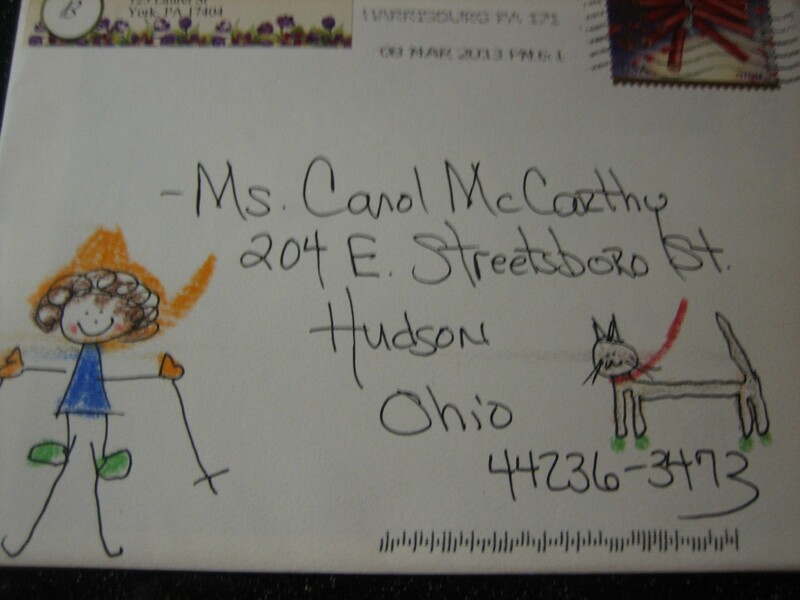 My letter friend Kathy from Pennsylvania likes to draw pictures on her envelopes. These pictures are often stick figures involved in the activities which Kathy’s involved in at the time. Sometimes Kathy draws simple flowers in sunshine. Trademarks don’t have to be fancy. Kathy is very musical. She sings in an orchestra chorus so she’ll often sign her letters with a musical note. That note is a trademark. 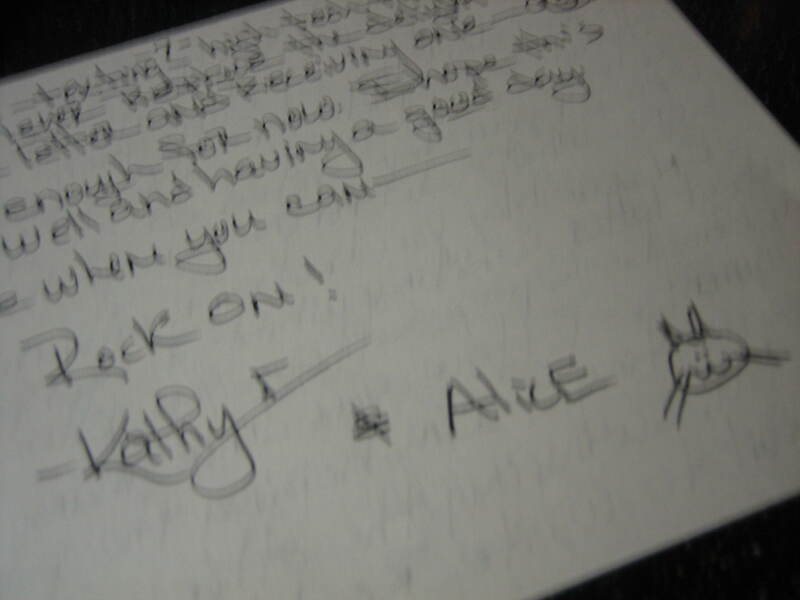 She also signs her cat’s name to her letters because Alice the cat is dear to Kathy, a best friend you might say. 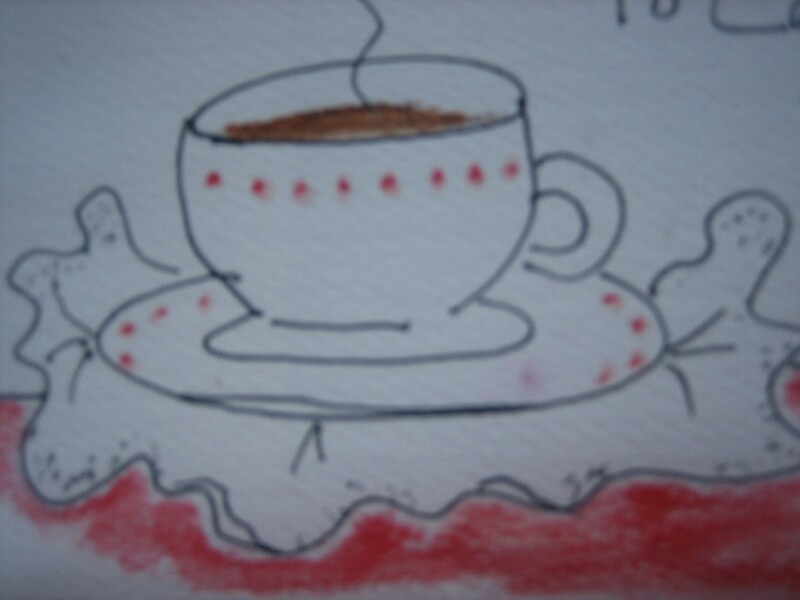 Along with Alice’s name Kathy often draws Alice. 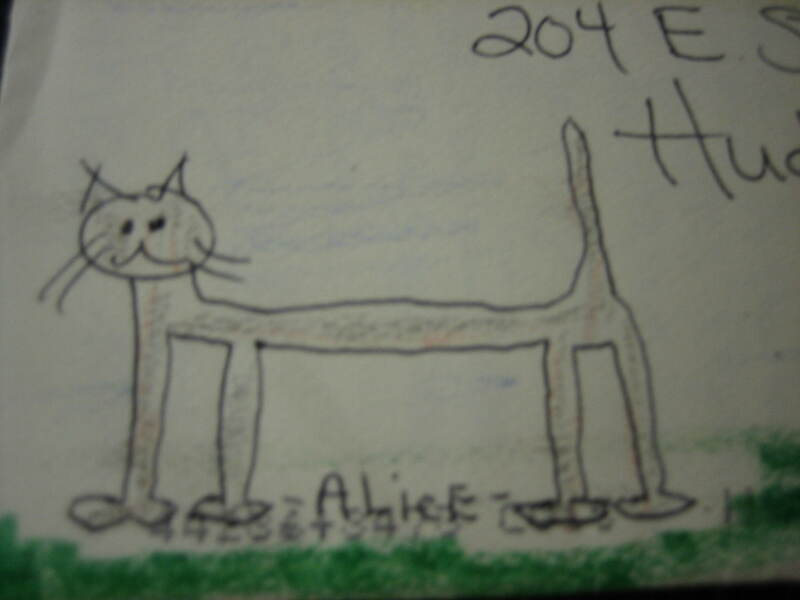 Alice’s picture on Kathy’s envelope is another of her trademarks. Trademarks are fun! Sometimes a trademark is simply a most unique and handsome handwriting. My pen friend Bruce, formerly of Arizona but now residing in heaven, had such a handsome handwriting. When he would be writing with his fountain pen in public places people passing by would notice his script , stop, and comment on how charmingly old fashioned and elegant his handwriting was. Bruce loved this. Who wouldn’t? 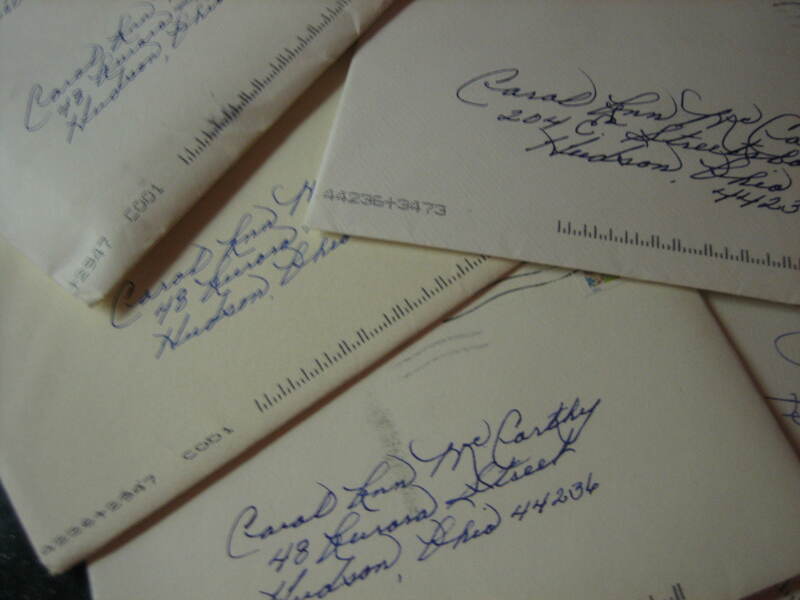 I would see the tiniest corner of Bruce’s handwriting peeping out from behind other letters in my mailbox and instantly light up knowing Bruce had come to call. Another favorite correspondent, Harry of Virginia now also residing in heaven, grew pansies in his window box expressly for my letters. 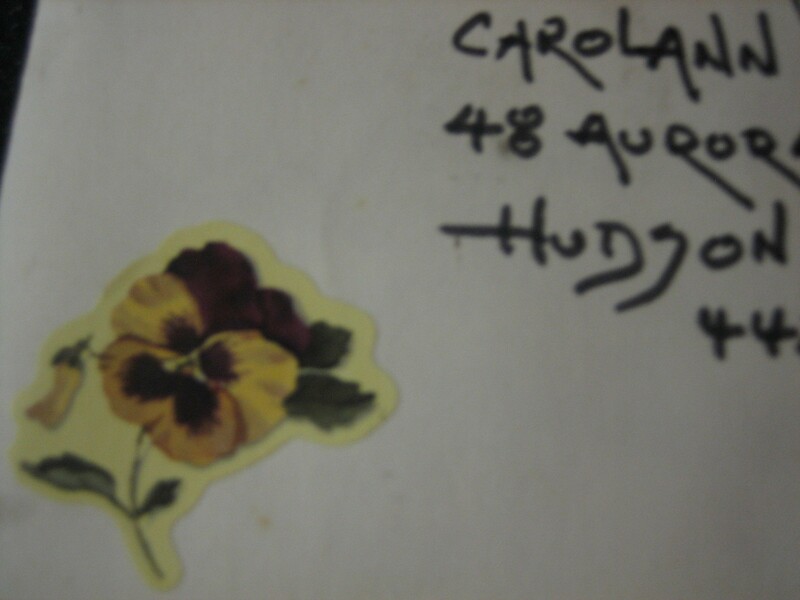 The pressed pansies would grace his letters, but usually a pansy sticker also graced Harry’s envelopes. Trademarks. Trademarks are great! Now I see a pansy and guess who comes to my mind. Trademarks will help you be remembered. Variety may be the spice of life, but a few “regular” personal marks used in your letter writing will say“You”even before pen friends spot a return address – like Charlie Chaplin’s cane or Liberace’s candelabra , your trademark will add an extra personal note to your letters and it’s these personal notes which make the Art of Letter Writing the very personal art it is . 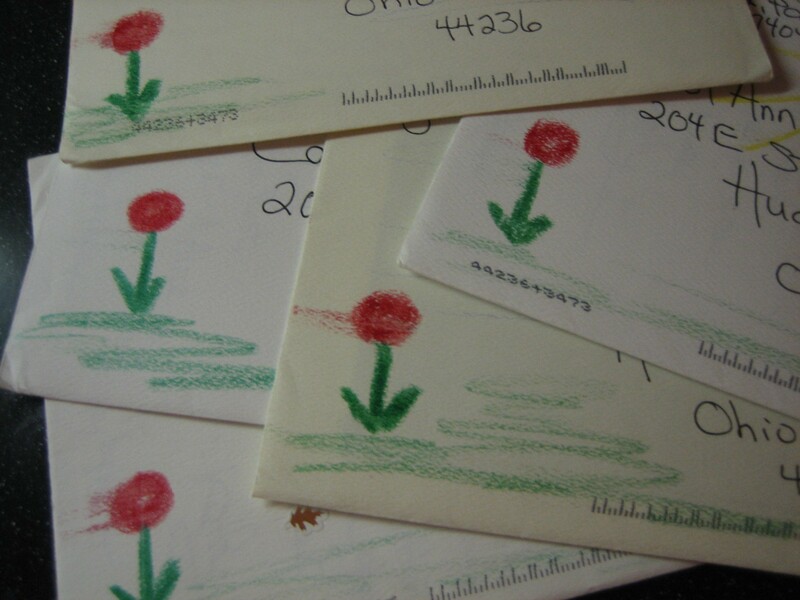 Another wonderful blog and what a delightful surprise to see pictures of my envelopes…indeed the stick lady, kitty, flower and sun are my “trade marks”…. :):):):):)and Bruce was one of my writer friends…I shared your blog with several others as well as the folks at The Letter Exchange….you are just so creative…a snail mail letter will be on its way to you very soon…. You are pretty creative yourself. I’ve always loved your drawings from way back when. If we lived local I know we’d be seeing a lot of each other. Thank you for sharing my post. I didn’t remember you knew Bruce as I did. Don’t you miss him?